The process the author uses to treat convergence insufficiency has been very efficient, effective and repeatable. Symptoms are generally resolved in 8-10 visits for neuro-typical children and adolescences. This treatment process does not include assessment of primitive reflexes though many of the activities (not by design) may help to integrate these retained reflexes. Treatment sessions are twice a week for one hour and home programs consist of a brock string performed 3-4 minutes in the morning and afternoon. The patient returns for their annual eye exam one year later and typically remain symptom free. Most of the referrals are made by Dr. Mark Obenchain OD, a binocular vision/peds specialist. He is a graduate of Indiana University where he completed a residency in binocular vision and pediatrics. He accepts all insurances and Medicaid. Our patients cover a board spectrum of demographics with approximately 2/3rds being neuro-typical and the remaining 1/3rd having an additional diagnosis such as ADHD, Autism, or other developmental delay. A complete pediatric eye exam with cycloplegic dilation is performed on every child under the age 18 regardless of complaints. The occupational therapy evaluation begins with medical history, medication history and a discussion of academic performance and hobbies. Observations are made during proactive and rotator 3 activities on Sanet Vision Integrator for eye-hand coordination, posture and balance. This performed while patient stands on balance board. The author does not assess visual perception at this time. The patient has been diagnosed with a near vision problem which could taint the results of this test. An OT evaluation is also an untimed code making the 30-45 minute test not efficient to perform at this time. If visual perceptual problems exist after meeting all CI related goals, then visual perception is assessed and treated. The therapy goals are specific and measurable as well as being tied to function. STG–Pt to fuse 15 BO loose prism to demonstrate improved fusion skills for improved reading and close tolerance. STG–Pt to complete 20/30 Rock card with 2.00 flipper in 60-90 seconds to demonstrate age appropriate accommodation skills to improve read and close work tolerance. Complete Developmental Eye Movement test with age appropriate ratio to demonstrate improve ocular motor accuracy for reading tasks. LTG–Pt to be (I) in use brock string to support in clinic treatment. The below protocol has been effective and repeatable with most neuro-typical children ages 6 and up. 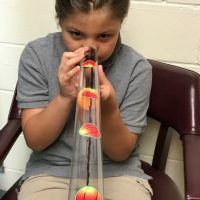 The author has modified activities for children that have difficulties with these tasks which lengthens the amount of treatment sessions but are still effective in meeting the above goals. 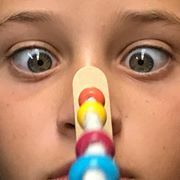 Proactive, performed monocular using R/B glasses, while standing on balance board, therapist holds head still while patient alternates touching dots with right then left hands regardless of placement of dots. Rotator 3, monocular, while on balance board. May touch with any hand, verbal cues to recall alphabet as needed. Tranaglyph slides with goal of reaching 30 BO and 12 BI. Loose prism Jump Vergences with “circle X square” tranaglyph for binocular feedback. Saccades 2 task on Sanet Vision Integrator, while on balance board, monocular with R/B glasses, head held still as needed. Goal is achieve 100% accuracy .5 interval with words. Visual motor integration tasks, tracing shapes, copying geoboard forms on paper and/or chalkboard/SVI and other visual motor tasks. CPT code 97530- therapeutic activities, a timed code, is used for all sessions. This entry was posted in convergence insufficiency, occupational therapy, vision rehabilitation and tagged accommodation, convergence insufficiency, learning disabilities, occupational therapy, pediatric optometry, pursuits, read problems, saccades, vision rehabilitation, visual motor integration, visual tracking. Bookmark the permalink.